There is no doubt that this is going to be a difficult year for America. Immigrants, women, people of color, Muslims, environmentalists, the LGBT community – there are many groups firmly in the crosshairs of the new Administration and the new Congress. Though only supported by a minority of American voters, the new President, Donald Trump, will not be shy in taking action to enhance his brand. We do not yet know the specifics, and it is clear that his opinions change about as quickly as you can hit refresh on your Twitter feed. But Trump’s lieutenants are the most clearly ideological and dangerous set of leaders ever assembled in American government on immigration and any number of issues we may care about. There is a vindictiveness coming to government the likes of which we have never seen, and with shadowy figures like Breitbart’s Steve Bannon or the Federation for American Immigration Reform’s Kris Kobach calling signals behind the scenes, there is reason to prepare for the worst. Immigrants and immigration were important campaign themes – or I should say, slandering immigrants and immigration were. The irony is that support for sensible immigration reform actually increased and support for mass deportation decreased during the year and a half that Trump campaigned for the White House. Across numerous polls, roughly 80% of the American people favor letting undocumented immigrants stay in this country and about 60% among Trump supporters. But that is not likely to translate into any sensible policies coming out of Washington. We expect to see the same recycled, deportation-only bills come through the House Judiciary Committee, but the difference will be that we no longer have a reliable Senate or White House backstop to contain self-destructive immigration ideas. Their game plan is simple: make legal immigration harder for everyone – and impossible for most people – and then rail against the resulting illegalities, decry the black market, label everyone as criminals, and use good old fashioned fear of “the other” to marginalize immigrants. The goals will be to demonstrate that Republicans are being tough, cruel, and unsympathetic to immigrants – especially undocumented immigrants — and tough on Mexico and Muslims in particular. That Trump and Congress are being driven by such ideological extremes will be the downfall of their agenda. Americans favor legal immigration and are rightly concerned about uncontrolled and illegal immigration, but those driving the issue in the Republican Party are opposed to immigration, period. They want fewer people – especially fewer people of color – in “their” country. The American people don’t believe we will deport 11 million undocumented immigrants and they are right. But those driving the issue are hooked on the mass deportation fantasy and the idea that more than 10 million people will self-deport. Most Americans, however, do not think a wall will actually work as an immigration control strategy and they sense that immigration is broader and deeper than the physical border to the South. But many Americans still voted for Trump because he tapped into the frustration many people feel because no one has been able to make immigration a safe, legal, and orderly process for the American people and those who seek to become Americans. So, supporters of immigration and immigration reform need to stick to our principals and keep fighting for our vision of a modern, 21st century immigration system because our vision is what the American people actually want. We have to do a better job of communicating that immigration reform is about more than being kind or respectful to immigrants. In the transactional world of American politics, doing something “for” one group is often perceived as doing something “against” everyone else, which is simply not the case with immigration. 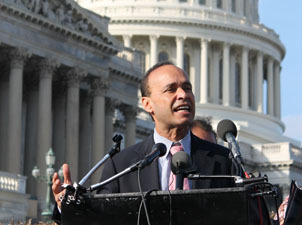 Congressman Luis V. Gutiérrez represents the fourth district of Illinois. He is nationally recognized for his tireless leadership championing issues of particular importance to Latino and immigrant communities. This entry was posted in Front Page, Immigration, Spirit Filled Network on February 15, 2017 by networklobby. Thank you, Congressman Gutierrez, for your stirring reminder that it’s no longer safe for any of us to be passive about government. The time is past when we have the luxury of being single-issue advocates. “Liberty and justice for all” is no longer a patriotic catch phrase. This is the year it has to become a mandate.